The CloneTracker™ 50M Lentiviral Barcode Library (formerly known as the CellTracker™ 50M Lentiviral Barcode Library and 13K × 13K Barcode Library) enables the tracking of individual clones derived from a population of cells. The pooled library contains more than 50 million lentiviral constructs with different barcode sequences. When a cell population is transduced with this barcode library, the barcodes integrate into the genomic DNA of the cells. The result is a select starter founder population where almost every cell has a different DNA-sequenceable barcode integrated into its DNA. Track the fate of cell clones over a course of drug treatment. Study the effect of differentiation on hematopoietic cells. Assess the effect of treatment on implanted tumor cell populations. 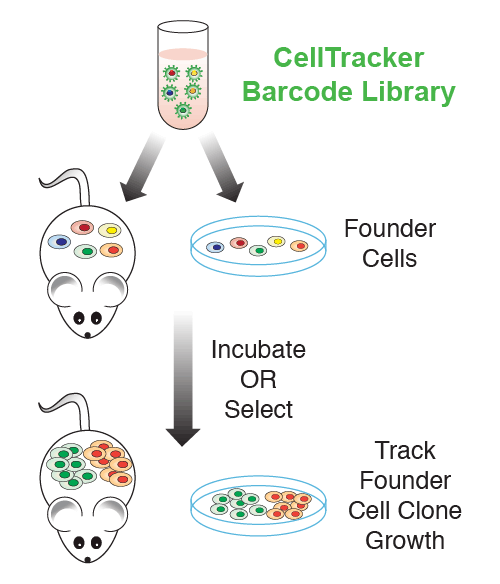 Cellecta's CloneTracker Barcode Library allows the tracking of founder cell clone growth. The CloneTracker 50M Barcode Library is constructed in a Cellecta third-generation lentiviral vector that expresses both TagRFP (Evrogen) and a Puromycin resistance gene under a human Ubiquitin C promoter. The specially-designed, optimized barcodes facilitate Next-Generation Sequencing (NGS) data analysis and barcode identification. Using an Illumina NextSeq or HiSeq NGS instrument, barcode sequences are identified and converted to lists with enumerated data. The protocols included provide guidelines for packaging the CloneTracker Barcode Library into VSV-G pseudotyped lentiviral particles, transduction of target cells, and the preparation of barcodes derived from transduced cells for NGS, enumeration, and analysis.